Comments: Very good condition softcover has some light general reading wear nice unmarked interior- a soild copy overall. We take great pride in accurately describing the condition of our books ship within 48 hours and offer a 100% money back guarantee. 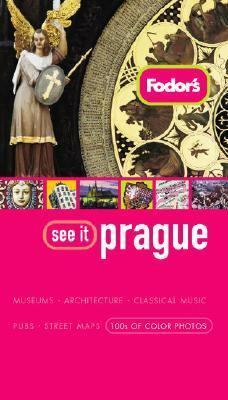 Fodor'ssee it Pragueis perfect for travelers who want to understand the history and culture of Prague before they arrive, and experience the country like a native while they're there. Overflowing with brilliant color photography, this isthe only illustrated guide that provides the practical informationthat you need while travelingcomplete restaurant and hotel reviews with exact prices for lodging and dining (not ranges), plus time-saving tips and how to avoid crowds, exact admission prices to key sights, great photo stops, and special notes on "kid-friendly" attractions throughout. Hotels Our detailed reviews represent the best accommodations in Prague, in all price ranges. From five-star luxury hotels to low-budget options, we'll tell you what to expect in terms of price and quality through extensive coverage of hotels and their surrounding neighborhoods, exact prices of double-occupancy rooms (including breakfast), plus pictures of hotel facilities and guestrooms. Restaurants If you want to experience the best that Prague has to offer, pay particular attention to ouroutstanding restaurant coveragethat will help you choose from the local eateries that cater to every budget and dining experience. From affordable, informal meals to romantic, candlelit dinners you'll find it insee it Prague. Each review covershouse signature dishes,ambiance,actual prices for a two-course lunch and a three-course dinner(for two people), hours of operation, and what transportation will get you there. The Sights Whether you want to wander through the cobbled streets to admire the stunning architecture, shop at elegant boutiques, or visit the Bohemian countryside,see it Praguewill take you there. Accessibly written to help you navigate throughout the country without missing a thing, each attraction includes exact admission prices, what galleries and museums not to miss, and where to stop for quick bites and refreshing drinks along the way. Sights are also rated for their"value","walkability","historic and cultural interest", plus we suggest fantastic"photo stops"and entertaining and age-appropriate"kid-friendly"attractions throughout the book. What to Do? Ourshopping walkswill lead you to cutting-edge fashions to fit all budgets, from hip streetwear to expensive fashions for your feet. But, Prague has much more to offer than just sight-seeing and shopping. Fodor'ssee it Pragueprovides insider information onclassical, theatrical, and cinematic performances,Prague's music scene,nightlife, spectator and activity sports, and festivals and events. Atlas and Maps Detailed neighborhood mapsare incorporated throughout the book to help you navigate on historic walks, shopping tours, or to find a restaurant. Plus, a16-page atlasdetails each road and path with highlights of important landmarks, parks, metro stations, and car parking areas. Fodor's see it A brand-new series thatshowsyou before you go,guidesyou while you're there, andmakes the perfect keepsakeon your return.Fodor's Travel Publications, Inc. Staff is the author of 'Fodor's See It Prague ', published 2006 under ISBN 9781400016549 and ISBN 1400016541. Loading marketplace prices 4 copies from $4.37 How does the rental process work?